Without God’s grace on Noah and his family, you and I would not be here today. Remember, the reason God chose to save Noah is given in Genesis 6:8, “But Noah found favor [grace] in the eyes of the LORD.” Noah did not begin his life a blameless [6:9], righteous man [7:1], “walking with God,” but he began a sinner. The only difference between Noah and the other sinners who drowned in the flood was that God was gracious to Noah. God choose undeserving Noah to be an object of His grace. This is the first time in the grace appears in word form in the Bible. God is so faithful to mankind despite their flagrant sin. God calls Noah to enter the ark. Final preparations from God arrive about the ark and the future flood. There are two very interesting items to note. First, God asks Noah to gather seven pairs of clean animals, and a pair of unclean animals. In God’s wisdom, the mixed genders of the animals give the ability for the animals to procreate after the flood, but what is the deal with the clean and unclean animals? At this point, there was no law [cf. Leviticus 11; Deuteronomy 14:3-12], nor any recorded conversation with Noah concerning the difference between pure and impure animals. In the context of the first chapters of Genesis, I tend to lean towards the belief that the distinction of clean and unclean animals was for the purpose of sacrifice. Sacrifice and worship were already a big part of God’s created order [cf. 3:21; 4:3-5; 9:20ff]. Second, God’s patience for man’s sin extended for 1600 years [Genesis 5], He allowed 120 years for people to repent [6:3], but no one did. The time has come and Noah has only one week to gather two of every kind of animal. This is totally an impossible task for one family to accomplish on their own, unless they have divine help [cf. 7:16; 2:19]. And again, Noah obeys all that God commands Him to do [cf. 6:22]. God’s sovereign rule and His expectation for man’s obedience run parallel to each other. God requires Noah to build the ark—taking 120 years—possibly showing the diligence of Noah’s obedience. Noah builds a big boat in a desert, for 120 preaches with no one listening only mocking, and God gives him 7 days to gather all the animals of the field and air before the flood walls burst [note: water came from above and below]. The decree of God comes to pass just as He promised. His sovereignty is displayed in His wrath against sin. This is one of the most sobering passages in all the Bible. The destruction was all encompassing and annihilating to every living thing on earth [7:19-23], except for what was in the ark of His grace. Doesn’t that sound like a great way to celebrate your 600th birthday? I am sure Noah was flooded with emotion. What would you be thinking? Could you image what Noah and his family was thinking as the storm clouds move in, as he notices neighbors and friends working the field, as he hears the voices of children and mothers in their homes, as they stand in the ark during the flood? “What about the other people who do not get into the boat? Is it fair that they are out there and we are in here? Has God left us alone? Will this boat stand the strength of this storm? Will we ever be able to get out of this boat? Will we have enough food?” We do not know what they were thinking, maybe fear, doubt, or loneliness. I remember as a child, I would hide from my mother in the clothing racks while shopping. She did not like that very much. One time we were in JC Penny’s and I thought it would be fun to hide extra hard and extra long. So I hid in the center of a tall rack of jean. I could hear my mother saying, “Justin, where are you? Come out this minute!” I waited until I couldn’t hear her anymore. I peaked out from the clothes and she was gone. I was alone. For a split second, I was excited because I lost her, but then I was filled with fear because I didn’t want to live in JC Penny’s the rest of my life. I loved my mom and didn’t want to lose her. I searched throughout the store yelling her name, but could not find her. Until I heard a voice from above say, “This is the costumer service counter. Would Justin Hutts please report to the service counter immediately.” The voice said it again. I ran to the front of the store. There was my mother with a look anger mixed with an embrace of grace. God has already shown Himself faithful. He is in the storm. His sovereignty is displayed as He fills the ark, He shuts the door on time, and He unleashes the flood re-creating of all He created. Holding the boat afloat and by His grace filled it with 8 people and enough animals to replenish the earth. God’s progress of redemption again takes chaos and shows His absolute control. The same language in Genesis 7 is used in the initial act of creation [Genesis 1; Note: Creation and Re-creation Comparison chart]. Even in the floods of judgment, when God seems most distant to our eyes, He is faithful to remember His own [8:1]. Noah is not forgotten. God gives Noah a glimmer of hope amidst the stormy seas. The word “remembrance” is found twice in this passage and only two other times in Genesis in relation to God and man. This word is used primarily to speak of a covenant God makes with His people, thus recalling a promise made by God to sustain man. In Exodus, this word used again, as God recalls the covenant relationship between Abraham and His children as they are living in Egypt [Exodus 2:24; 6:5]. This is the kind of remembrance that God has for Noah and his family in the ark. God is faithful in carrying out His plan and executing His promises to Noah [cf. 6:18]. It only took forty days for the waters to rise and destroy the earth, but it took about 5 months for the waters reside. What is Noah doing during this time? He patiently waits [8:10, 12]. How many of you would be willing to wait on God like Noah? How many of you when bad things happen with impatience plead with God for immediate relief? Noah simply waits. He waits for a word from God before leaving the ark [8:15, 18]. God speaks; Noah obeys. Noah knew God was at work. The rain stopped and the waters began to reside. Do you see the sovereignty and faithfulness of God at work? Do you see the rhythmic ebb and flow of the flood story? In conclusion, the flood flexes the character of God as sovereign dealing with sin [death, Romans 3:23; 6:23], and faithful to His own through the flood. We are also confronted with the patience of God and how He is offended by sin. We are encouraged by Noah’s faithful obedience. Noah was particular, not partial, in following God’s instruction. ‘Cutting corners’ would mean the destruction of his family too. God expects lifelong obedience. Noah is an example to all of us not just of obedience but also the faithfulness of God in the midst of the fierce flood. 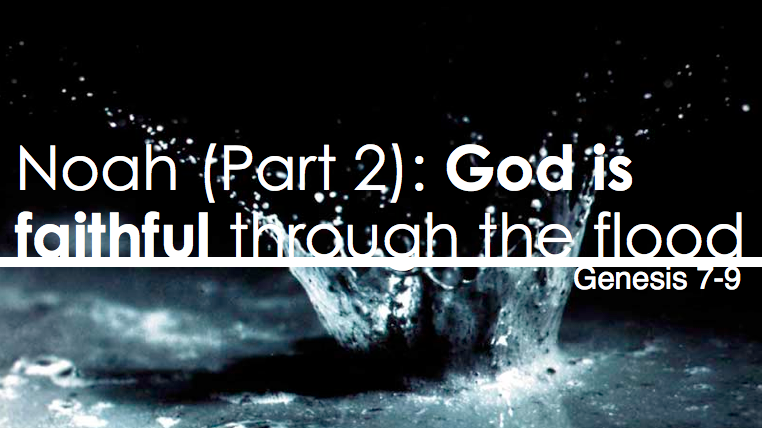 Questions for Reflections and Application: In light of Genesis 6:5-7 and 2 Peter 2:4-9 why did God send the flood? What does the flood reveal about the fate of those who continue in sin without repentance? According to Romans 3:21-28, how is the Old Testament act of atonement ultimately applied to Jesus Christ? According to I John 4:7-21, how is Jesus’ atonement related to Gods love and ours? Later, Paul the apostle carries this word in his New Testament teaching on salvation ”by grace through faith alone”. Noah was a favored because God saved him by grace and he had faith in God alone. Is God just to send the flood? Yes. Why didn’t He give them more time? He gave them 1600 years, plus 120 years of warning, and 7 final days to turn. Why didn’t he send a preacher? He did. Noah preached for 120 years, but no one repented. He was the Billy Graham of his day. Why didn’t God let them sin? You would curse God for His injustice. Why didn’t God save them? He did. He had Noah build a boat. No matter all that God does to people still choose not to heed God. The flood was a day of judgment, which would be echoed in God’s prophets as they foretold the Day of the Lord, “The prophets also appealed to the imagery of creation’s reversal to depict the day of the Lord’s judgment [i.e. Isaiah 24:18b; Jeremiah 4:23-26; Amos 7:4].” (cf. Bruce Waltke, Genesis: A Commentary. Zondervan, Grand Rapids, MI. 2001. 139.) This type of imagery is not seen until the end of time, which is prophesied in the Book of Revelation. Cf. 9:14-15; 19:29; 30:22; Exodus 2:24; 6:5; 32:13; 1 Samuel 1:19; Judges 16:28; Job 14:13; Psalm 8:4; 9:12; 74:1-3; 98:3; 105:8; 106:45; 111:5; Jeremiah 15:15.